If you glanced at Atlanta's Ron Clark Academy, you'd think you were in the middle of Hogwarts and might expect to see Harry Potter and his crew sitting in the classrooms. But that couldn't be further from the truth. What you will see is a group of talented fifth- through eighth-graders, learning not only math and science but also life lessons they'll be able to take with them when they leave the school. Named after its founder, Ron Clark, the private school is definitely something special. 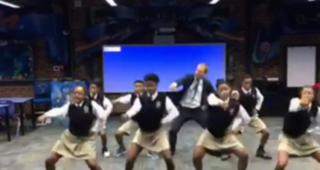 "It's hard to explain the Ron Clark Academy. It is a place that's about passion, energy," Clark said earlier this year. "I wanted to create a school where you could feel the spirit, wanted kids to walk into this school and say, 'I love coming here.' If you've got individuals who are passionate about making a difference in the lives of kids, they're going to be successful." What also makes the school special is Clark himself. Clark is the New York Times best-selling author of The Essential 55 and was a Global Teacher Prize finalist. On top of all that, he has some slick dance moves—and it's those moves that got him and a few of his students to go viral. Clark posted a video of himself and a few students dancing and doing the Nae Nae, as well as other dances. In less than 24 hours, the video has racked up over a million views! Clark and his students definitely deserve a round of applause!